With the development of industry, the number of devices that need to be monitored and receive various data from them is increasing. To solve the problems of the interaction of a large number of devices and the problems of integrating devices into one network, the concept of the Internet of Things - when devices are combined for some reason into one network, then several similar networks are combined into another big net and so on. Devices in such networks interact with each other by means of various interfaces and data transfer protocols. Since we are talking about the industrial application of the IoT concept, which should use industrial equipment with its own protocols and hardware, we turn to the concept of IIoT (Industrial Internet of Things). To communicate with each other, devices use various industrial protocols, one of the most popular protocols for this purpose is MQTT. MQTT or Message Queue Telemetry Transport is a lightweight, compact and open data exchange protocol designed to transfer data to remote locations where small code size is required and there are bandwidth limitations. The above advantages allow it to be used in M2M (Machine-Machine Interaction) and IIoT (Industrial Internet of Things) systems. There is also a version of the MQTT-SN protocol (MQTT for Sensor Networks), previously known as MQTT-S, which is designed for embedded wireless devices without TCP / IP support, for example, Zigbee. The MQTT protocol works at the application level over TCP / IP and uses the default 1883 port (8883 when connected via SSL). The exchange of messages in the MQTT protocol is carried out between the client, which can be the publisher or subscriber of messages, and the broker of messages (for example, Mosquitto MQTT). The publisher sends data to the MQTT broker, indicating in the message a specific topic. Subscribers may receive different data from multiple publishers, depending on the subscription to the relevant topics. Topics are UTF-8 encoded characters. The hierarchical structure of topics has a “tree” format, which simplifies their organization and access to data. Topics consist of one or several levels, which are separated by the symbol “/”. Sibling wildcard. The “+” symbol is used to apply it. Layered wildcard. The symbol “#” is used to apply it. Message Type – for example: CONNECT, SUBSCRIBE, PUBLISH and others. Flags specific to each MQTT packet – these 4 bits are reserved for auxiliary flags, the presence and status of which depends on the type of message. Remaining Length – represent the length of the current message (variable header + data), can take from 1 to 4 bytes. RETAIN – when publishing data with the retain flag set, the broker will save it. The next time you subscribe to this topic, the broker will immediately send a message with this flag. Used only in messages with type PUBLISH. The variable title is contained in some headers. Will Retain – when set to 1, the broker stores Will Message. Will QoS – quality of service for Will Message, with the Will Flag flag set, Will QoS and Will retain required. Will Flag - when the flag is set, after the client disconnects from the broker without sending the DISCONNECT command (in cases of unpredictable communication failure, etc. ), the broker will notify all connected clients via the so-called Will Message..
Clean Session – clean the session. When set to “0,” the broker will save the session, all client subscriptions, and also pass on to him all messages with QoS1 and QoS2 that were received by the broker during the client’s disconnection at the next connection. Accordingly, when “1” is set, when reconnecting, the client will need to re-subscribe to topics. Session Present – used in a message with a CONNACK type. If the broker accepts a connection with Clean Session = 1, it must set “0” to the Session Present (SP) bit. If the broker accepts a connection with Clean Session = 0, then the value of the SP bit depends on whether the broker has previously saved the session with this client (if so, 1 is set in SP and vice versa). This parameter allows the client to determine whether the previous session was saved by the broker. The content and format of the data transmitted in MQTT messages are defined in the application. The data size can be calculated by subtracting the length of the variable header from Remaining Length. 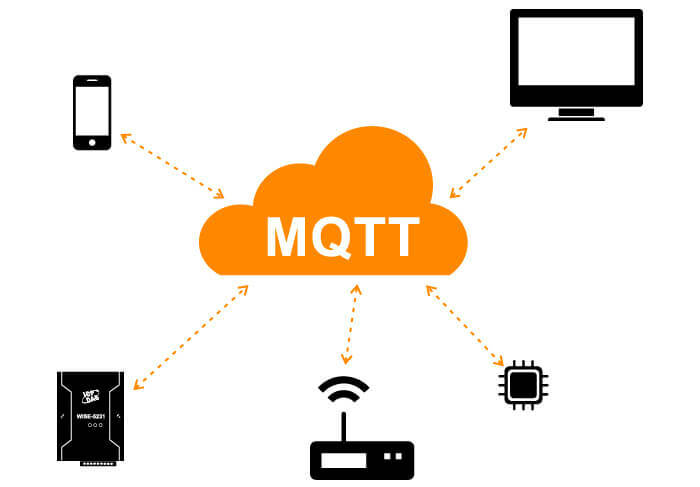 MQTT supports three levels of quality of service (QoS) in the transmission of messages. QoS 0 At most once. At this level, the publisher sends a message to the broker once and does not wait for confirmation from him, that is, sent and forgotten. QoS 1 At least once. This level ensures that the message will be delivered exactly to the broker, but there is a possibility of duplication of messages from the publisher. After receiving a duplicate message, the broker again sends this message to subscribers, and the publisher again sends confirmation of receipt of the message. If the publisher has not received a PUBACK message from the broker, he re-sends this package, while the “1” is set in the DUP. At this level, delivery of messages to the subscriber is guaranteed and possible duplication of sent messages is excluded. The publisher sends a message to the broker. This message indicates a unique Packet ID, QoS = 2 and DUP = 0. The publisher keeps the message unconfirmed until it receives a response from the broker PUBREC. The broker responds with a PUBREC message that contains the same Packet ID. After receiving it, the publisher sends a PUBREL with the same Packet ID. Before the broker receives PUBREL, he must keep a copy of the message at home. Upon receiving PUBREL, it deletes a copy of the message and sends a message to the publisher that the transaction is complete. Client authentication. A CONNECT package can contain USERNAME and PASSWORD fields. When implementing a broker, you can use these fields for client authentication.